Wow, I think I can stop blogging now. 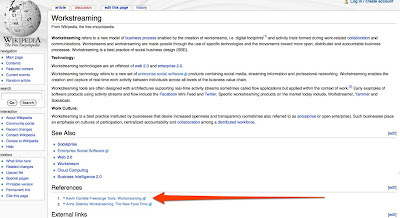 Someone thought that something I wrote was worth a link from Wikipedia: Workstreaming. What's left to accomplish? Will freeranging finally get its own page? Is it time for me to finally get that Wikipedia tattoo? I bet I could write a Knol on the topic that would be found in search. The problem would be outranking all those chicken posts. Hahaha, I already own the category Google search: HighTouch #1-- Wikipedia #2.